Every once and a while, I come across some true weirdness in the New York Times. I actually love when the Times gets odd and unpredictable. A phrase from today's paper (online edition) inspired this doggerel poem, which I wrote before reading the article. It was just too delicious to pass up. Soon to become my taco. Destined for the dinner plate. Put the cuke to shame. a poet? A lyricist? An artist? Copyright & Fair Use at the Stanford University Libraries. Understanding Fair Use at the University of Minnesota Libraries. Electronic Frontier Foundation, Legal Guide for Bloggers. Photograph by Saroy. Source: Flickr. Used under the terms of a Creative Commons Attribution-NonCommerical-NoDervivs 2.0 Generic license. 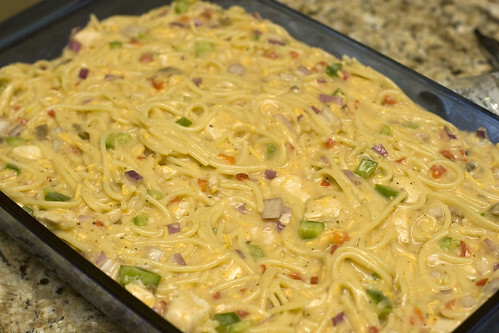 When I started this blog in 2005, my first idea was to make the whole thing about chicken spaghetti, a favorite casserole of my Southern childhood. I thought about posting variations on the recipe and photos of how they turned out. However, I soon realized that an audience for such a blog would be non-existent tiny. So, instead I turned my attention to kids' books, but kept the name since it seemed child-friendly. I still think about the dish, though, and, after a Twitter search, have located my fellow casserole people. Like me, lots of other folks like their mom's version, Grandma's, Aunt So-and-So's, and when they're really pleased with their own efforts, they post pictures. Anna Beth is at it again. chicken spaghetti and fried porkchops!! A poem doesn't do everything for you. Gwendolyn Brooks, (1917-), "Song of Winnie"
The sidewalk on the south side of 41t Street leading up to the New York Public Library on Fifth Avenue is called Library Way, and contains many of bronze plaques like the one above with quotations about literature and writing. Sponsored by the New York Public Library and the Grand Central Partnership, Library Way stretches from Park Avenue to Fifth, and was created by the artist Gregg LeFevre. The Gwendolyn Brooks excerpt is about poetry, sure, but it's also an extended metaphor, encouraging an active engagement with life and the world around you. That's why I liked it so much, and took a picture one sunny morning last summer. For other poetry posts this morning, see the roundup at Radio, Rhythm & Rhyme. Source: Merriam-Webster Online. http://www.merriam-webster.com/dictionary/fascinating Website accessed 12.15.12. I am seeing poems all over these days. (Uh, oh.) Last week it was in a nonfiction YA book; today the poetry comes via the Merriam-Webster online dictionary entry on the word "fascinating." I cracked up when I read the above. It struck me as a delightfully weird collection of rhyming words. If someone were writing a poem, would she really like to rhyme "fascinating" with "carbon dating"? So, of course, I had to try my hand at it. Seven eighting, railroad freighting, irritating. Other children's book bloggers are also talking about poetry on Friday. (I am posting a little early). See the Poetry Friday roundup tomorrow at Kate Coombs' blog, Book Aunt. And go ahead. Take a shot at your own "Rhymes With Fascinating" in the comments. "One day that winter, as [5 year old] Benjamin and [his father] Richard were standing in the parking lot of his nursery school listening to the fire alarm from a distance, Benj cried, 'Daddy, I am not afraid! Just like Frog and Toad! '—a reference to a story called 'Dragons and Giants,' in which Frog and Toad face down some scary experiences by telling themselves that 'they are not afraid.' "
This is a moving book written by a literary agent and former English professor and Wordsworth scholar. Gilman's older son, Benj, read early. By the time he was two and a half, he could fluently read a page from her dissertation. The precocity was unusual, but accepted as evidence of the boy's intelligence and the family's devotion to the written word; Gilman's husband, mother, and father also had careers concerned with literature. But Benj's sensitivities and intolerance to other stimuli worried Gilman, and eventually he was diagnosed with hyperlexia, defined by Merriam-Webster as "precocious reading ability accompanied by difficulties in acquiring language and social skills" and sometimes associated with autism. I was curious if Gilman's work on The Anti-Romantic Child affected her interactions with her son's various schools and teachers over the years. She doesn't say. No matter. Her hopeful and well-written story, about Benj's struggles and triumphs—and the gradual shift of her own expectations—ought to appeal to parents and teachers of children of all abilities, not to mention anyone interested in reading. A number of poems by Wordsworth, to which Gilman turns for solace, are woven into the fabric of the book. Remembering ten years ago, I want to highlight a prose poem I love, Linsey Abrams' "The New Century," which can be found online here. hand down 95 flights of a pitch black stairwell, albeit with a better than average flashlight. crazy, like a conga line. Meanwhile, I read an excellent book recently: The Hare with Amber Eyes, by Edmund de Waal. It's about art, architecture, family history, great sorrow, and survival. De Waal's descriptions of the Nazi takeover of Vienna, where his wealthy Jewish grandparents lived, broke my heart, leaving me with an echo of the why? why? why? feeling of 9/11. Tomorrow my family plans to be out and about, savoring the end of summer. There's an Internet nature project happening—International Rock Flipping Day—and we're hoping to participate. The blog Wanderin' Weeta has the details. Check it out and join in if you'd like! I'd be remiss if I didn't mention a kids' book that fits the theme well: Compost Critters, a picture-book photo-essay by National Geographic photographer Bianca Lavies (Dutton, 1993). Over the years I've enjoyed many poets' autobiographies and books of letters. So why not make a list of favorites! The following titles are for adults, but some teenagers might like them, too, particularly the ones by Eileen Simpson, Jackie Kay, Mary Karr, and Natasha Trethewey. Poets in Their Youth, by Eileen B. Simpson (Random House, 1982) Berryman, Lowell, Schwartz, et al. Red Dust Road: An Autobiographical Journey, by Jackie Kay (Atlas, 2010). Kay's search for her biological parents, one in Scotland, the other in Nigeria. Lit, by Mary Karr (Harper, 2009). Karr's road to sobriety. Beyond Katrina: A Meditation on the Mississippi Gulf Coast, by Natasha Trethewey (University of Georgia Press, 2010) Trethewey returns to her hometown, where her mother was killed and her brother incarcerated. Randall Jarrell's Letters (Houghton Mifflin, 1982). Mary Jarrell, editor. A Wild Perfection: The Selected Letters of James Wright. Anne Wright and Saundra Rose Maley, editors. (Farrar, Straus and Giroux, 2005). I read half of this one and got overwhelmed several years ago, but want to return to this book and finish it. I may have to revise as I remember more. What are your favorites? Today is Poetry Friday on many of the children's literature blogs. Karen Edmisten is rounding up the posts at Karen Edmisten: The Blog With The Shockingly Clever Title. For an explanation of Poetry Friday, check here. Today the Library of Congress names a new poet laureate: Philip Levine, an eighty-three-year-old Detroit native who has written extensively about blue-collar work. Levine succeeds W.S. Merwin. Book critic Dwight Garner writes an appreciation of Levine's work over at this morning's New York Times. "It is a plainspoken poetry ready-made, it seems, for a time of S&P downgrades, a double-dip recession and debts left unpaid," Garner says. Readers will find poems by Levine online at the Academy of American Poets and the Poetry Foundation. From the latter, here's an excerpt from "Belle Isle, 1949". Sentimental it is not.